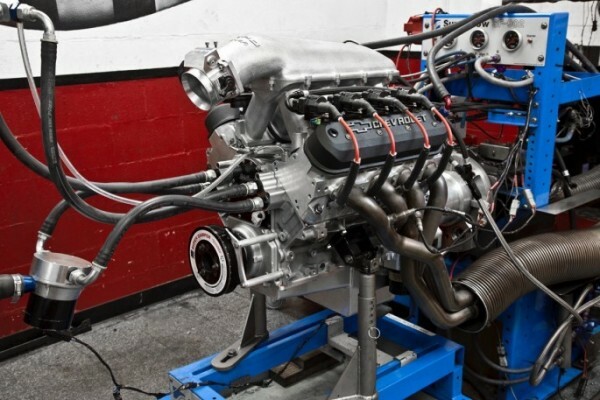 Anyone can slap a supercharger on a stock 505-horse LS7 and pick up an extra 200 horsepower. And thanks to the incredible untapped potential of GM’s factory LS7 cylinder heads, gaining huge chunks of horsepower through natural aspiration is fairly easy, too. All it takes is some head work, long-tube headers, and a big hydraulic roller cam. However, things get a bit more challenging in racing classes which place strict limitations on engine modifications — like NHRA Stock Eliminator. In these highly competitive classes, scratching and clawing for that last percentile of horsepower separates the apex predators from the bottom-feeding rodents. That’s precisely what the School of Automotive Machinists & Technology did to fortify its COPO LS7 for Stock Eliminator competition. SAM Tech used a bunch of little engine-building tricks — like minimizing ring drag, stabilizing the valvetrain, maximizing cylinder wall integrity, and experimenting with countless valve jobs — to pump up the power. The resulting numbers are absolutely astonishing: 825 horsepower and 8,300 rpm with a hydraulic roller camshaft, factory GM cylinder head castings, and a production LS7 aluminum block. That’s nearly two horsepower per cubic inch — and 320 horsepower more than stock — despite utilizing basic hardware that’s not much different from what’s found in a stock C6 Z06. “Getting the first 90 percent of an engine’s horsepower potential is easy, the next five percent is hard, and the last five percent is (the hardest),” said SAM Tech Director of Education Judson Massingill. Put another way, while the bulk of the hot rodding world is perfectly content settling for the first 90 percent, only the smartest guys in the room can find the next five percent. The quest to find the last five percent, however, goes down in top secret assembly rooms that exist entirely off the grid. 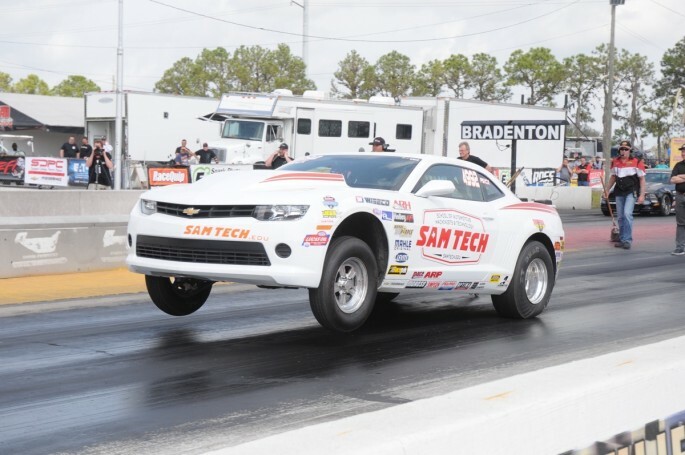 Although no Pro Stock or Sprint Cup team in its right mind would reveal trade secrets of this caliber, as an educational institution, SAM Tech was more than happy to divulge what it takes to build a race-winning Stock Eliminator LS7. Cutting-edge projects like these serve as the perfect testbed for students and instructors to apply lessons learned in the classroom to real-world race engines. Straight from GM, the COPO LS7 is no ordinary LS7. Although GM’s official horsepower rating of 425 is supposed to make people feel all nostalgic, the figure is completely bogus. Even after accounting for the differences in SAE and STP (standard temperature and pressure) correction factors, the horsepower gap between the COPO LS7 and a stock LS7 are immense. The COPO’s long-tube headers and Holley Hi-Ram intake manifold are obvious upgrades from stock, but diving beneath the valve covers and oil pan reveal more significant changes. Although the COPO motor shares the same block, bore diameter, and stroke dimensions as a production LS7, its rotating assembly is completely different. It features a Callies Compstar steel crankshaft, and forged 6.100-inch rods matched with Mahle 13.0:1 pistons. In addition to increasing the compression ratio more than two full points over stock, the pistons boast a Grafal anti-friction coating and low-tension rings. The COPO’s camshaft is a completely different animal as well, with 233/276 degrees of duration at .050 and .630/.630-inch lift. This is quite a bit larger than the 211/230 at.050 cam (.591/.591-inch lift) found in the stock LS7. 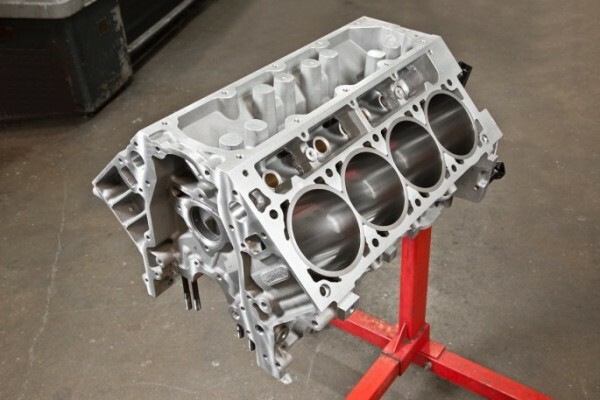 The 43-degree duration split on the COPO may seem radical, but when matched with CTS-VR hydraulic lifters, PSI beehive valve springs, titanium intake valves, and a COPO-specific CNC program that squeezes a smidgen more airflow out of the LS7 cylinder heads, the combination turns 8,000 rpm out of the box. Consequently, the challenge of building a competitive Stock Eliminator LS7 isn’t merely improving upon a stock 505-horsepower LS7. The daunting mission at hand is improving upon a highly optimized COPO LS7 that’s already producing 200-plus horsepower more than stock. Porting cylinder heads is difficult enough as it is, but throwing a rulebook into the mix is like trying to design a set of ports with one arm handcuffed to a workbench. Fortunately, sanctioning bodies are sometimes forced to revise rules that are difficult to police. “Racers have figured out how to hide port work, so the NHRA has given up on trying to enforce that rule. Instead, they’ve come up with a maximum allowable volume for the ports, and a minimum volume for the combustion chambers,” Massingill said. Given these restrictions, improving airflow is much more difficult, but not impossible. Straight from the factory, the COPO LS7 head castings flow an impressive 375 cfm. Despite having to work within an NHRA-specified maximum port volume, SAM somehow increased airflow to 390 cfm. 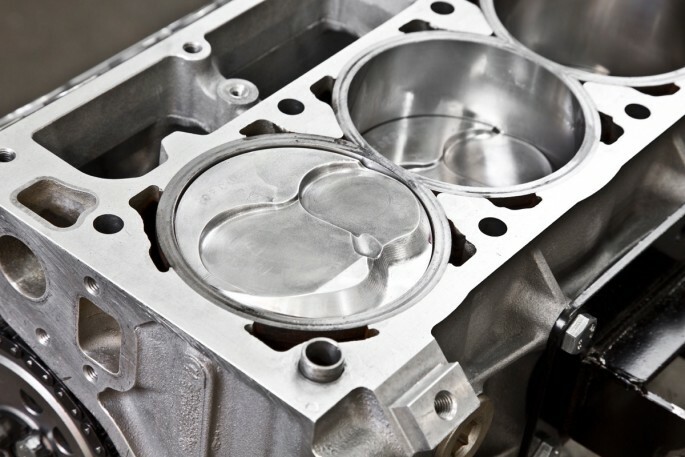 “The maximum intake port volume we’re allowed is 275cc, so we milled down the intake flange surface to shorten up the length of the port just slightly. This gives us some extra room to touch up the short-turn radius, bowl, and valve job area and increase the cross-section a bit without exceeding the cc limit,” Massingill said. In the not-so-distant past, turning 8,000 rpm was the exclusive territory of solid-roller race engines. Not only has GM managed to significantly increase the maximum engine speed of the COPO LS7’s hydraulic roller valvetrain, it gets the job done with parts that look deceivingly ordinary. 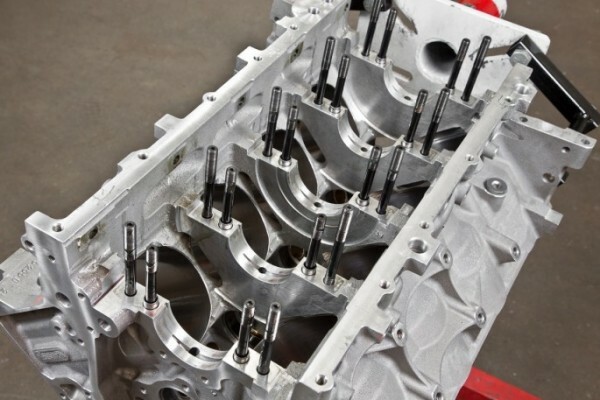 GM fits the heads with stock LS7 titanium intake valves, sodium-filled exhaust valves, PSI beehive valve springs, and lightweight steel retainers. Managing valve actuation duties is a 233/276 at .050 cam, 3/8-inch pushrods, stock 1.8:1 LS7 rocker arms, and lightweight ceramic ball lifters originally designed for GM’s CTS-V racing program. To wring some more rpm out of the COPO LS7, SAM Tech spec’d out a custom camshaft to take advantage of their improved cylinder head design, and also focused on stabilizing the valvetrain. After testing several different grinds, SAM Tech opted for a custom Comp 258/276 at .050 cam. The additional 25 degrees of intake duration helps build cylinder pressure higher in the rpm range, and the wide 116-degree lobe-separation angle further extends the powerband at high rpm. Since the NHRA limits maximum valve lift to .641-inch, as no surprise, the cam picks the valves up exactly .641-inch. 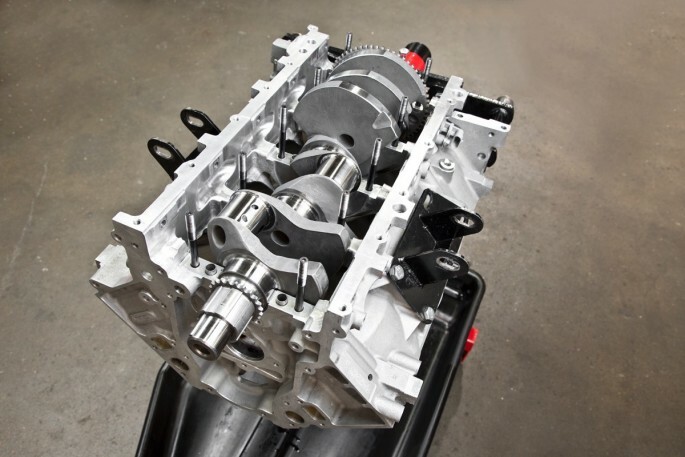 Although the excellent factory GM valvetrain is a tough act to follow, SAM Tech recognized some areas for improvement. If increasing cylinder pressure is the key maximizing torque, then converting that torque into as much horsepower as possible involves preventing cylinder pressure from falling off at high rpm. With the countless hours and dollars which go into optimizing the induction package and valve events to achieve those key objectives, preserving cylinder pressure is just as important as creating it. With a 4.400-inch bore spacing and 4.125-inch diameter bores, cylinder wall thickness is already at a premium in a stock LS7. Since NHRA rules allow for up to a .070-inch overbore, racers are bound to push the limit even further to pick up some additional displacement and give the valves some extra breathing room. 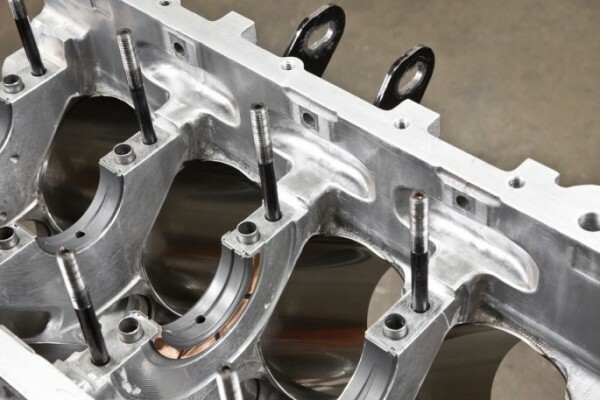 To reduce cylinder distortion while also enjoying the benefits of a larger 4.185-inch bore, SAM Tech shipped the block off to ERL Performance to replace the factory gray iron liners for a set of Darton dry sleeves. “The ductile iron Darton uses is the same material used in Funny Cars and Top Fuel cars, so they’re not going to move around at all. We also tied all the main caps together with a girdle to stiffen the block up some more,” Massingill said. As engine rpm and piston speed increase, parasitic power loss skyrockets. Even in stock trim, the LS7’s relatively long 4.000-inch stroke yields a brisk piston speed of 4,666 feet per minute at 7,000 rpm. Simply raising peak rpm to 8,300 rpm increases piston speed to 5,533 feet per minute. That means that each piston in SAM Tech’s COPO LS7 is dragging its rings up and down the bore an additional 14.45 feet per second compared to stock, which equates to a whole lot of friction. 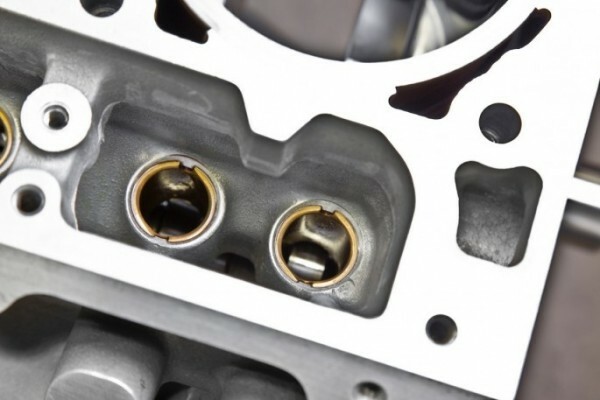 The obvious solution is applying a deep plateau hone to the cylinder walls to strike an optimal balance between oil retention and a slick surface finish. “On a high-end racing engine, the right cylinder hone and ring package can make a 25-35 horsepower difference,” Massingill said. While a slick cylinder wall finish is rather ordinary by race engine standards, the other friction-reducing tricks SAM Tech’s LS7 has up its sleeves are anything but. The NHRA rulebook strictly regulates piston design by prohibiting gas ports and specifying a minimum ring groove width. As a clever workaround, SAM Tech replaced the COPO LS7’s standard .043-inch top and second rings with thinner .027-inch Total Seal units. The reduced surface area offered by the thinner rings cut down on friction and provide superior conformability to improve cylinder seal. Nevertheless, thinner rings are more prone to flutter, which would usually be a bad thing if it wasn’t for Total Seal’s ingenious solution. By matching the thin rings up with gas-slotted ring spacers, the result is additional ring support and further enhanced ring seal. 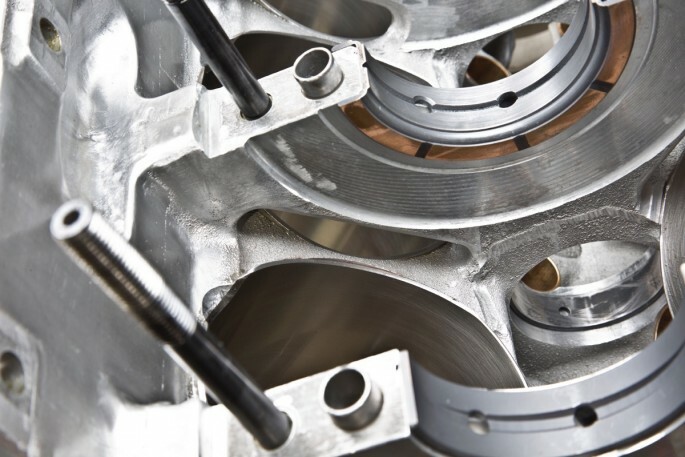 Since pistons aren’t the only components in the rotating assembly subject to frictional power loss, SAM Tech devoted equal attention to the crank and rods as well. 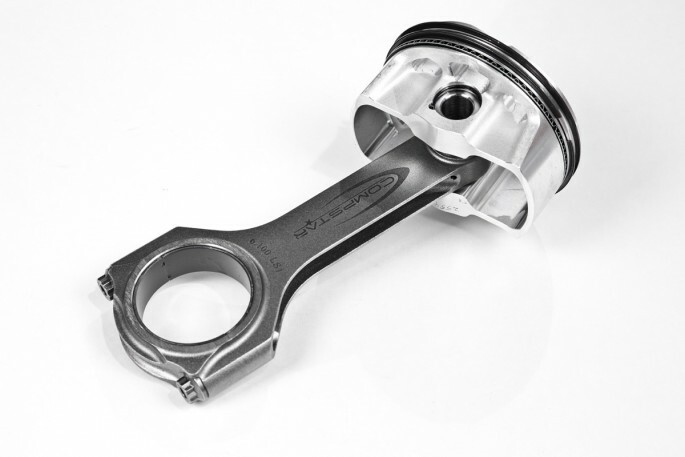 The spec crankshafts and rods mandated by the NHRA effectively ban the use of smaller-diameter Honda rod journals as a means of reducing bearing friction. SAM Tech had to get more creative by narrowing the Number 1 and 5 main bearings .055-inch and the rod bearing .062-inch. “Due to crank flex, the bearing load on the Number 2 and 4 main bearings are much higher than on the Numbers 1, 3, and 5. A crankshaft with center counterweights can help even out the loads, but the spec crank we have to run doesn’t have them so we stuck with standard-width bearings on the Number 2 and 4 mains,” Massingill said. 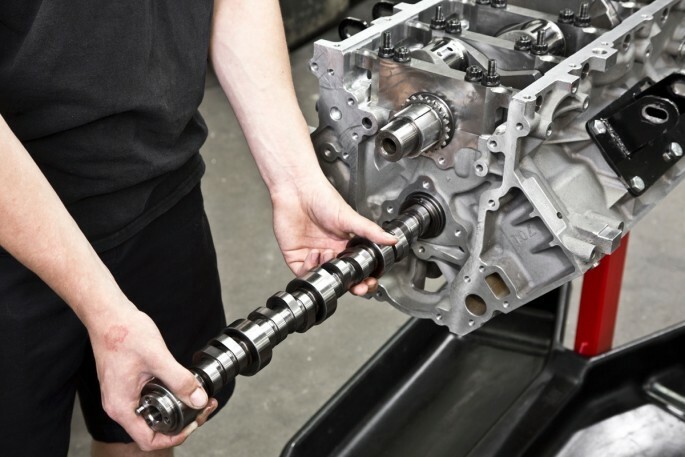 When the task at hand involves accelerating the crankshaft with as much ferocity as possible, anything that enables the crankshaft to rotate more freely can potentially reduce parasitic power loss. Although the LS7 block’s deep-skirt design provides excellent support of the main caps, the downside is that it isolates the crankcase into four separate sections. 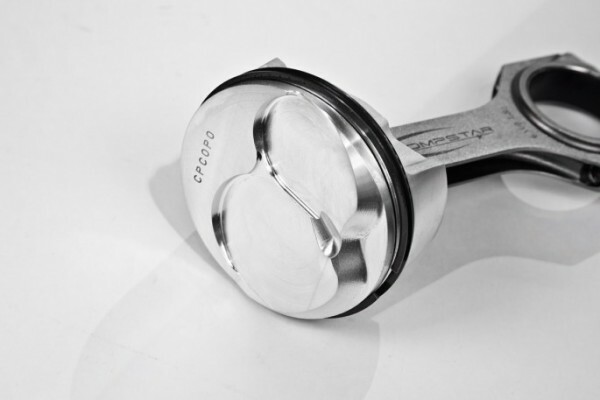 Consequently, crankcase pressure can create resistance against the piston as it travels down the bore. 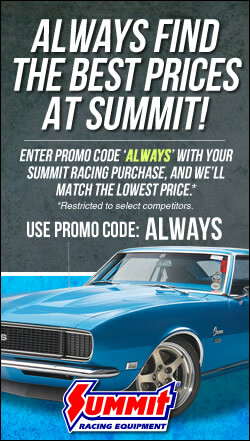 A vacuum pump offers an easy solution, but they’re banned by the NHRA on the COPO LS7. Recognizing this problem, GM enlarged the breathing windows on the LS7 main caps to improve bay-to-bay ventilation. SAM Tech took things a few steps further by radiusing the breathing windows and polishing out the crankcase to a smooth finish by removing casting flash. As with crankcase pressure, oil windage is yet another obstacle standing in the way of free and easy crankshaft rotation. In order to better manage the COPO LS7’s windage, SAM Tech relies on a few tried-and-true techniques. Unlike factory LS7s, the COPO LS7 do not benefit from a dry sump oil system. 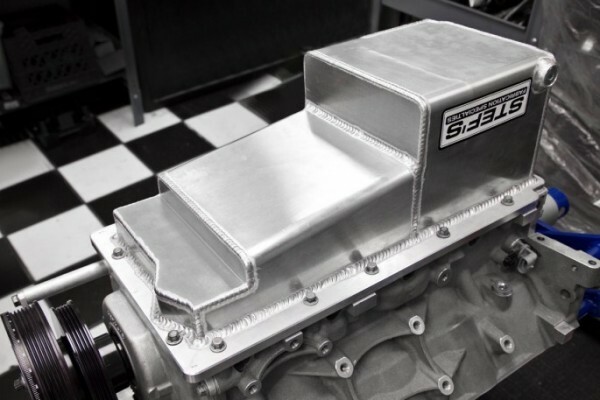 To prevent the counterweights from whipping through the oil, SAM Tech opted for a Stef’s deep sump seven-quart oil pan. 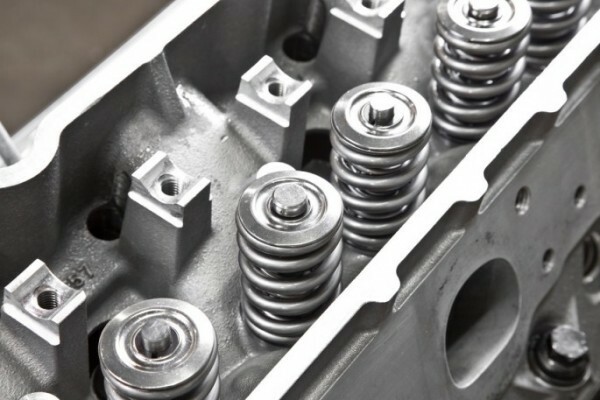 Likewise, bushed lifter bores restrict oil flow to the top end, preventing excessive volumes of oil from dripping back down onto the crankshaft. Check out the slides below to get an up-close look at SAM Tech’s Stock Eliminator LS7 and scroll down for the dyno numbers. With a stream of Renegade 116-octane fuel running through the rails, the COPO LS7 performs best on 31 degrees of timing. SAM Tech varies the air/fuel ratio between 12.7:1 and 13.2:1 depending on the level of competition on a given race weekend. 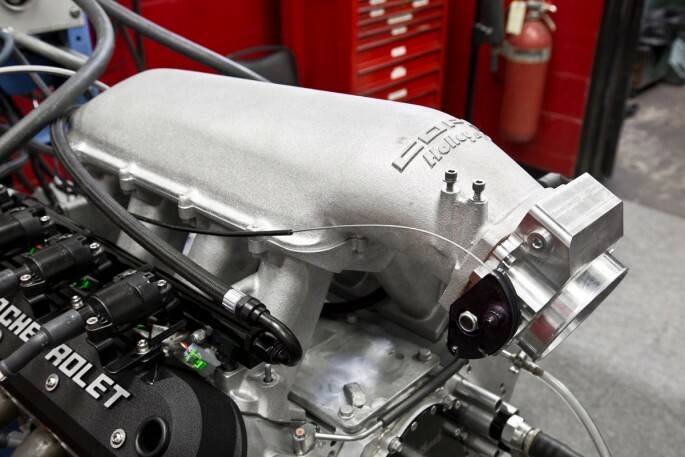 A Holley Dominator EFI system is tasked with engine management duties. 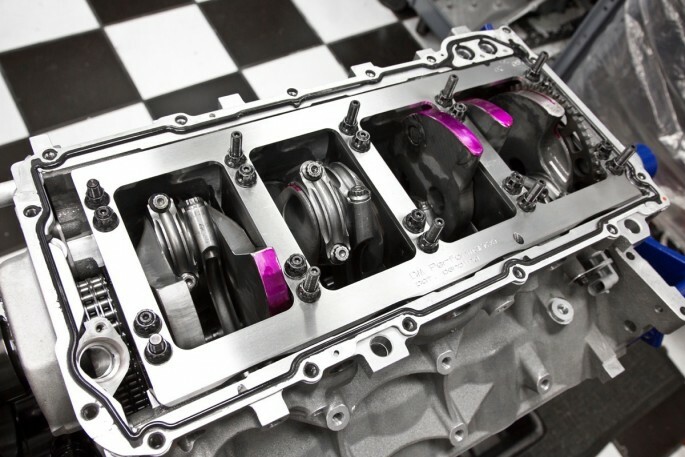 Beyond 700 horsepower, the factory LS7 block is notorious for cracking, particularly in forced induction applications. Replacing the factory gray iron liners with Darton ductile iron sleeves virtually eliminates the possibility of cylinder wall distortion and cracking. When honing a race engine, the goal is to have just enough surface area on the wall finish to seal the rings, since too much surface area can compromise oil retention. As such, SAM Tech hones the COPO LS7 to an RA value of 10-12, and a RZ value of 100-120. The Gen III/IV small-block’s deep-skirt architecture separates the crankcase into four distinct “compartments.” GM casts recesses between each bay of cylinders, beneath the pan rails, to improve crankcase breathing. SAM Tech radiused the breathing notches in the block and the main caps to further improve bay-to-bay crankcase ventilation. Removing casting flash from the crankcase eliminates stress risers and the potential for cracks to develop. Main bearings Number 1 and 5 have been narrowed from .805- to .750 inch to reduce friction. Since the Number 2 and 4 main bearings endure the most abuse, and the Number 3 bearing serves as the thrust bearing, SAM Tech left them at the stock width. The account for forging variations, the NHRA allows for an additional .015-inch of stroke length. Not surprisingly, many racers now offset grind the Compstar LS7 cranks to 4.013- to 4.015 inches to gain an additional 1.3- to 1.5 cubic inches of displacement, depending on bore diameter. With a 4.185 bore and a 4.015-inch stroke, the SAM Tech’s COPO LS7 checks in at 441 cubic inches. The NHRA limits maximum valve lift to .641 inches, but duration specs are unrestricted. Limiting the travel of the lifter plungers allows for more aggressive ramp opening rates. On the dyno, the COPO motor ran best with two degrees of cam timing advance. The bushed lifters bores reduce the size of the oil hole to .045. Since the factory LS7 block does not benefit from priority main oiling, limiting the flow of oil to the lifters and the heads offers more consistent oil pressure. The NHRA mandates a spec Compstar 6.100-inch steel rod as well as a spec piston. The SAM Tech combo utilizes Compstar rods, but several manufacturers—including Eagle and Carrillo—offer NHRA-approved components as well. Tight regulation keeps rotating assembly bobweight at a reasonable 1,750 grams. After narrowing the rod bearings from .792- to .730 inch, SAM Tech chamfered the edge of the bearings as well. 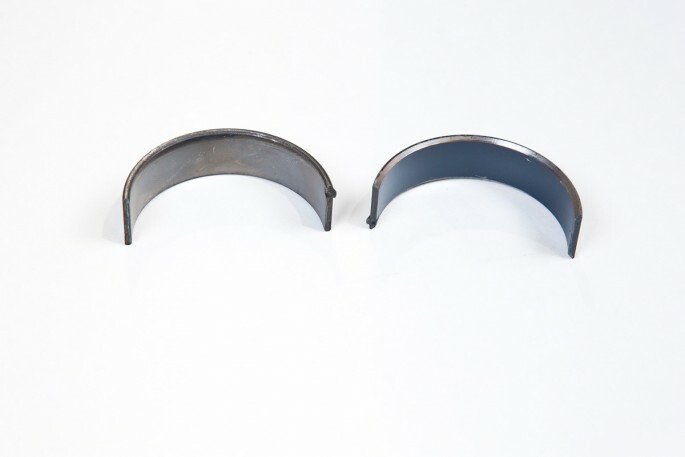 Compared to the stock bearings (left), the Clevite units (right) feature an anti-friction coating. SAM Tech opted for Wiseco pistons with a 12cc dome, but CP, Ross, and Diamond offer NHRA-approved pistons as well. 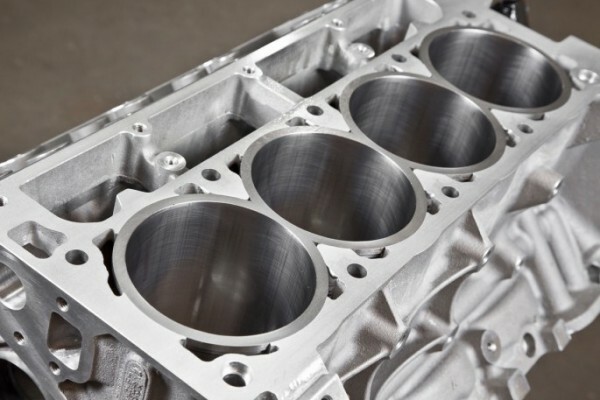 According to Judson, there is a negligible difference in piston weight, ringland thickness, and overall quality between each brand, but he prefers the consistent quality offered by Wiseco. 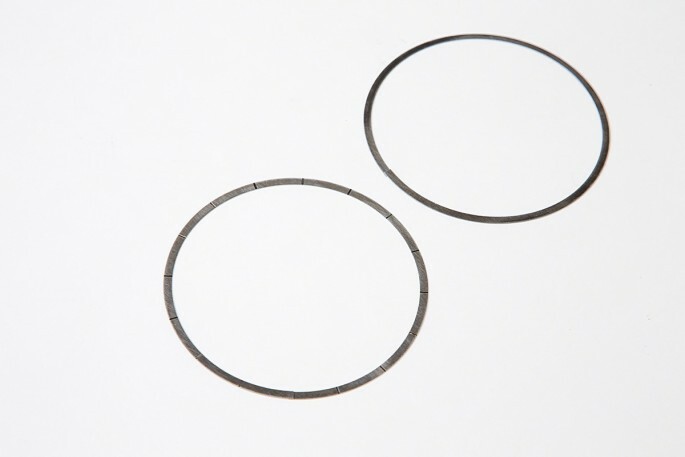 At .027 inch, the Total Seal rings (right) aren’t just super thin, they also utilize a proprietary coating to reduce friction. The .016-inch spacers offer similar benefits to gas ports by incorporating 15 horizontal gas slots around their perimeter. By tying all five main caps together, the DM Performance stainless steel girdle reinforces the mains and adds rigidity to the bottom of the block. Its design can potentially decrease oil windage as well. Since the factory cast LS oil pans serve as a structural component of the block, the Stef’s pan features beefy ½-inch-thick billet rails. The pan’s seven-quart capacity and deep sump allow oil to drain as far away from the crank as possible to reduce windage. 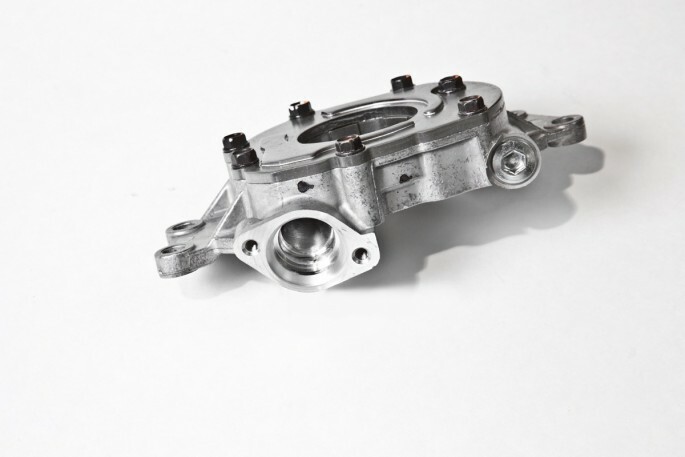 The GM oil pump is yet another surprisingly capable factory component. SAM Tech enlarged and radiused the inlet and outlet, but otherwise the pump is stock. To eliminate any flow restriction on the suction side of the pump, it’s fed by a larger-diameter Stef’s pickup tube that increases oil flow and prevents cavitation at high rpm. Instead of a fixed compression ratio limit, the NHRA specifies a maximum piston dome volume of 12cc, a minimum combustion chamber volume of 66cc, and a minimum quench clearance of .041 inch. SAM Tech opted for .055-inch Cometic MLS head gaskets and set the deck clearance at .008 out of the hole. By increasing the bore and stroke to 4.185 and 4.015, respectively, SAM Tech bumped up the compression ratio from 13.5:1 to 14.8:1. Both the length and cross-section of a port determine its total volume. By milling the intake flange surface .050, SAM Tech was able to increase the port cross-section at the short-turn radius and bowls without exceeding the NHRA-mandated limit of 275cc. 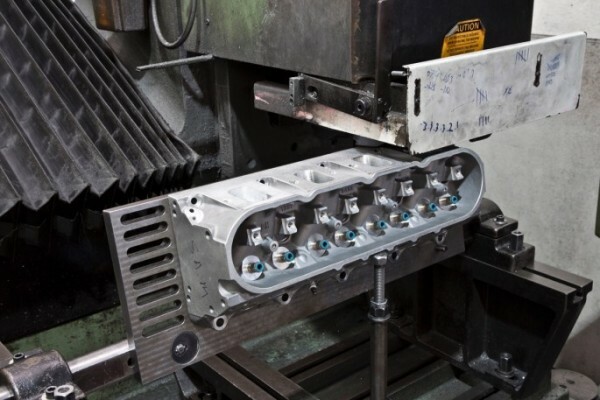 The word on the street is that the COPO LS7 cylinder heads are worth 12-15 hp over a factory LS7 head due to differences in CNC programs. SAM Tech’s port work increased flow from 375 to 390 cfm. 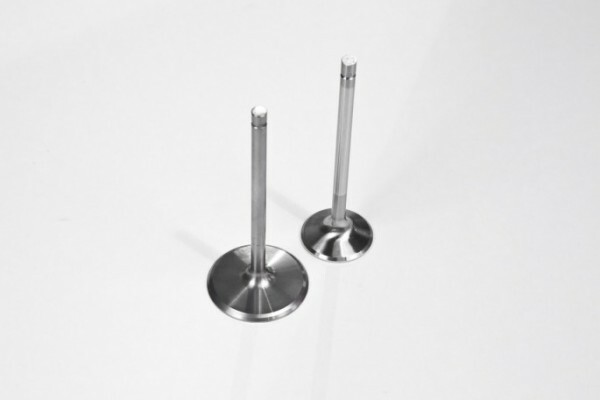 The stock Del West titanium intake valve and sodium-filled exhaust valves are so light and durable that SAM Tech saw no reason to replace them. They check in at 2.025/1.615 inches, which is the max allowed by NHRA rules. 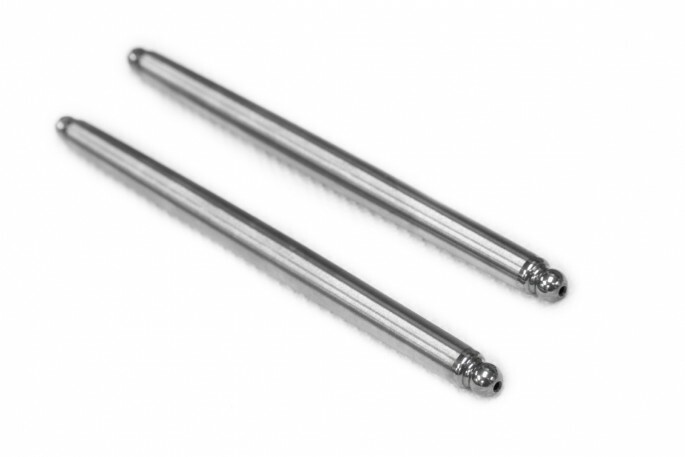 The stock 3/8-inch LS7 pushrods are quality pieces, but higher valve spring pressure increase deflection. As such, SAM Tech upgraded to Smith Brothers 7/16-inch chrome-moly pushrods, which required enlarging the pushrod holes in the cylinder heads just a tad. Essentially a tunnel-ram with a forward-facing throttle-body, the spec COPO Holley Hi-Ram intake manifold represents a monumental improvement over the stock manifold at high rpm. SAM Tech enlarged the bolt holes just in case it needed to be shifted slightly for better port alignment, but otherwise the intake is stock. In stock trim, the SAM Tech’s COPO Camaro ran a best of 9.51 at 141 mph. With a hopped up LS7 between the framerails, the car has run a best of 9.14 at 145.58 mph. Students and instructors work tirelessly at the shop and at the track to squeeze maximum performance out of the COPO package. Can you say anything other than “WOW!!! !” I never got that with the L-88 2nd design engine I was using. Max was 625 h.p. with custom intake and much bigger cam; though it went for a bit longer at close to peak power, this shows how much the development has grown since those days. I can just get rich and go by a car that makes 740+ power as I put it on the trailer!!!! Now for those get rich plans….. where did I put them??? ?